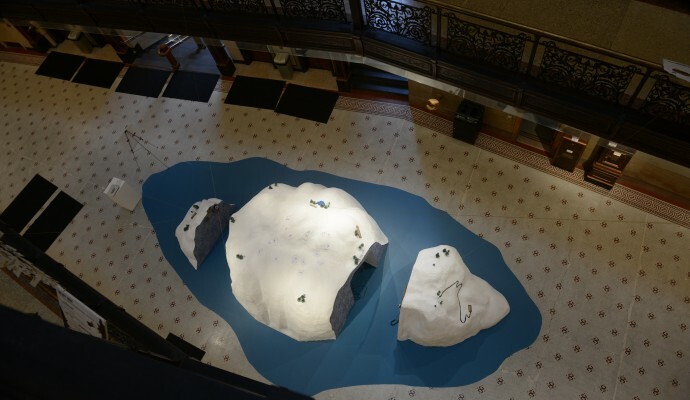 For several weeks in October, visitors to City Hall came upon a 4-foot Styrofoam island in the center of the rotunda. The white island was dotted with tiny green trees and surrounded by blue paper, representing water. It looked like an iceberg in the middle of an ocean. “It represents the isolation that some seniors in Milwaukee feel,” said Anne Basting, a theater professor at the University of Wisconsin Milwaukee’s Peck School of the Arts. The island were part of an art exhibit called “Islands of Milwaukee,” a collaboration between Basting and the Sojourn Theatre. The exhibit was created as a way to share the voices of isolated seniors. “These people are part of the city and … they have voices,” said Basting. 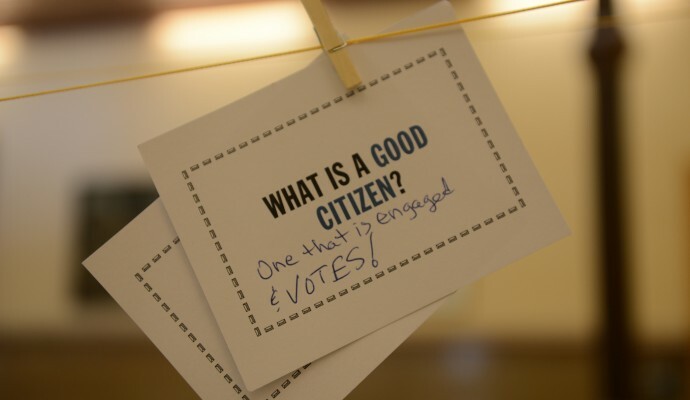 “City Hall seemed like the place to bring those voices back into the community and reestablish them as valuable citizens,” she added. Basting and Sojourn Theatre identified five seniors who spoke about particular aspects of senior care services: homecare, home-delivered meals, telephone reassurance and accessibility to older adult programs. The team recorded these seniors talking about some of the joys in their lives: from bird watching to writing a song with Basting. Visitors to the island could listen to these recordings through headphones. 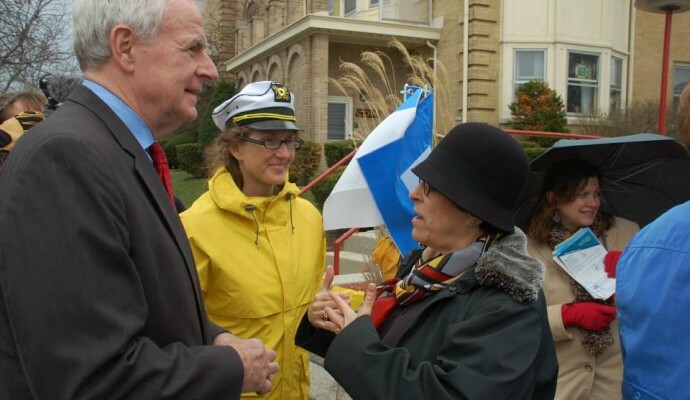 “The purpose of the voices on the island is to humanize the issue of senior isolation,” Basting said. During the past two years, 2,500 seniors answered 45 different questions that were delivered with Milwaukee Country Department on Aging home-delivered meals. Exhibit visitors were invited to write their own responses and clip them onto the ropes. “The questions provide the option for you to answer with a simple response or to dig deeper and answer metaphorically,” said Sarah Freimuth, one of two graduate students who worked on the project. 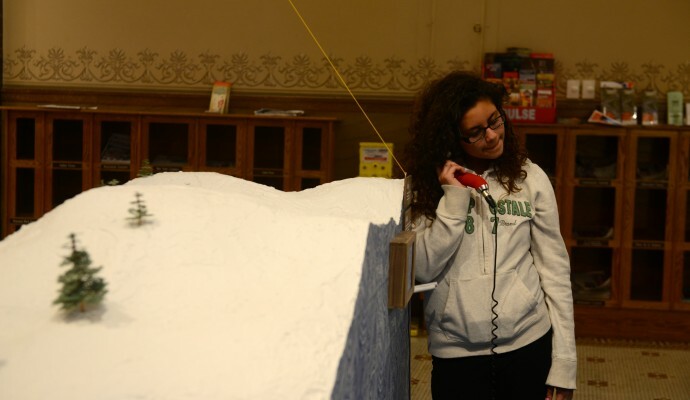 By answering the questions, visitors could connect with someone new or a lifelong friend in a new way, she added. Freimuth, a second-year student studying social work and gerontology at UWM, organized the seniors’ responses and hung them on the display. “Hearing the voices and reading the handwriting is something I treasured throughout the project,” she said. Susan McFadden, a professor at the University of Wisconsin-Oshkosh, also was fascinated by the questions of the day when she visited the exhibit. “They reveal so much more than social scientists usually get from their standardized surveys or [in] their interview protocols,” she said. 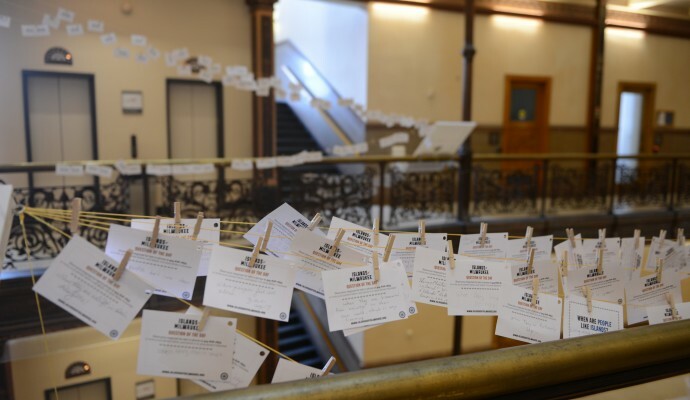 Basting and Sojourn Theatre partnered with Interfaith Neighborhood Outreach, Milwaukee County Department on Aging, and Peck School of the Arts to create the exhibit. 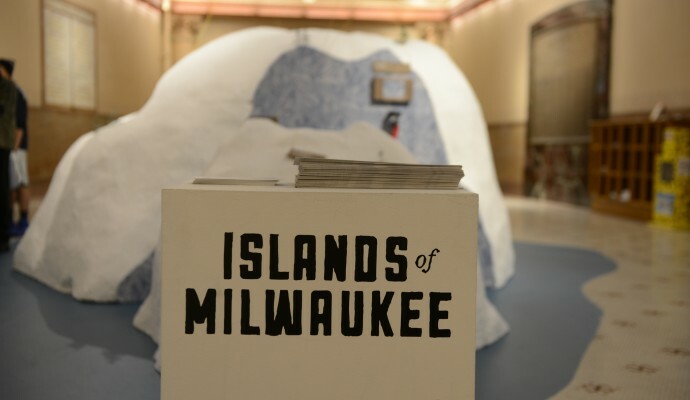 Islands of Milwaukee is an ongoing project. An earlier event called “Crossings” demonstrated the difficulties seniors have in crossing the street before the light turns. Helene Fischman, an artist and graduate student at UWM, said the project is an example of how community members can connect and help others. “The content of the project honors that we are all creative beings – that staying alive and staying connected is not based solely on food and even meeting with people, but on self-expression,” she said.